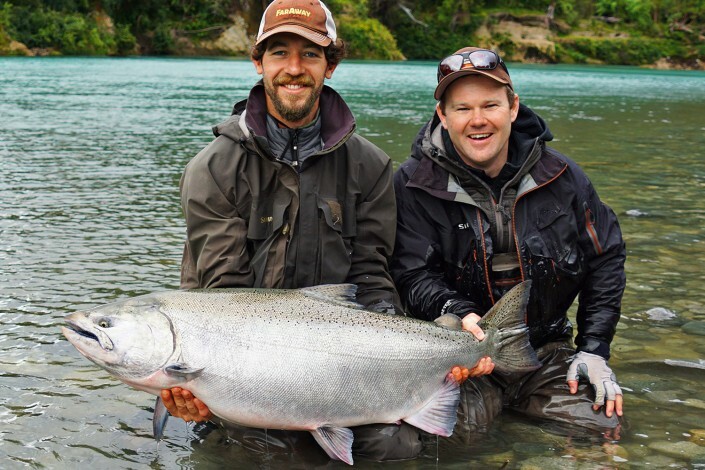 The first king salmon enter the river during December and our season starts in early January and run well into March. 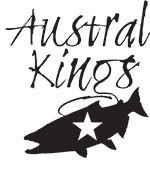 Austral Kings is all about fishing for fresh king salmon so we end the season well before the fish start to color up. Based on the 2016 exploratory season all our weeks are peak season. We could probably start a few weeks earlier and surely finish a few weeks later but for 2017 we are only offering prime weeks. 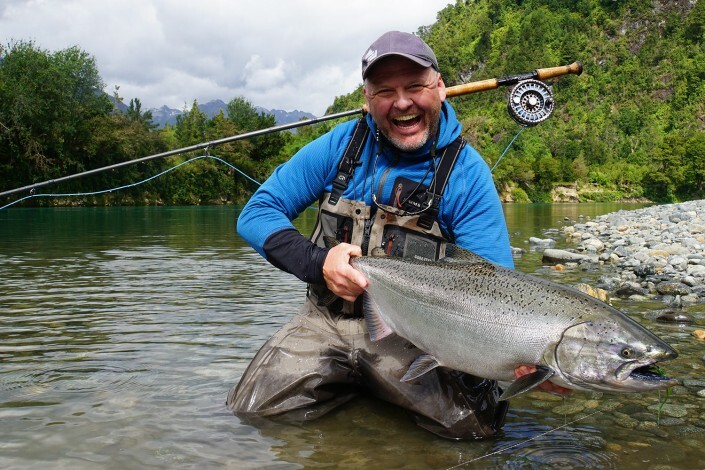 On every tide new fresh king salmon enter the river and at any given week in season you will be fishing over a remarkable number of fish that will often show while rolling. What makes good weeks turn into great weeks is therefore not based on the number of fish in the river but rather on the best possible weather conditions. Very clear water and blue skies makes for tougher fishing than when a bit of rain or melt off help color the water a bit. And with the surrounding granite mountains a blown out isn’t possible. In short, pick any week in season that suits your calendar and you will have the chance of hooking a chrome-bright king salmon of a lifetime. 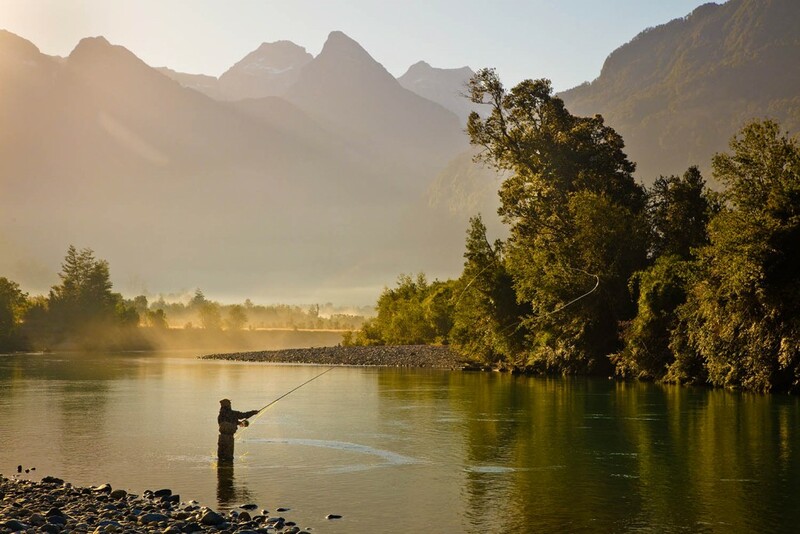 Our fishing season is during the Chilean summer so the weather is generally quite friendly. Most of the time temperatures will be between 10 and 20 degrees Celcius (50 to 70 degrees Fahrenheit.) Due its closeness to the marine environment we might have occasional rain or fog. Looking back at our first season at Austral Kings it is hard to be anything other than overjoyed and very optimistic about the seasons to come. 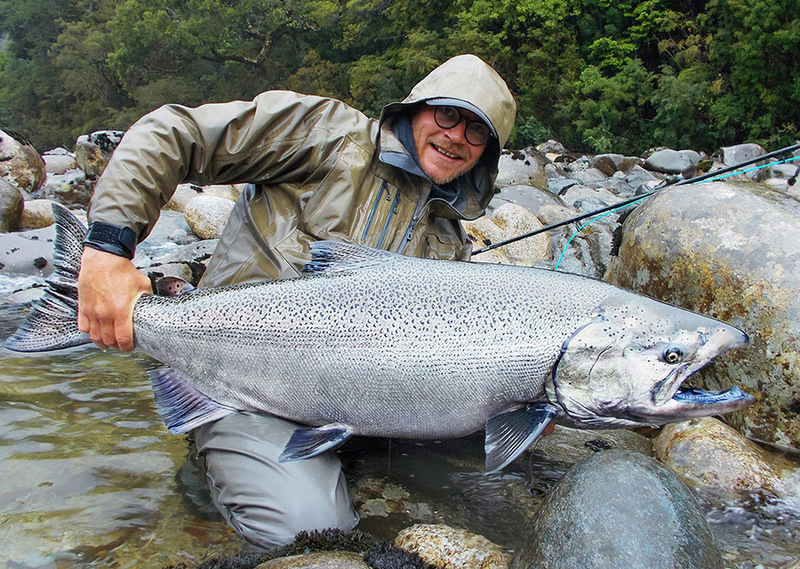 That things are looking promising is quite an understatement – Austral Kings is probably the best fly fishing for big chrome-bright king salmon found anywhere in the world! 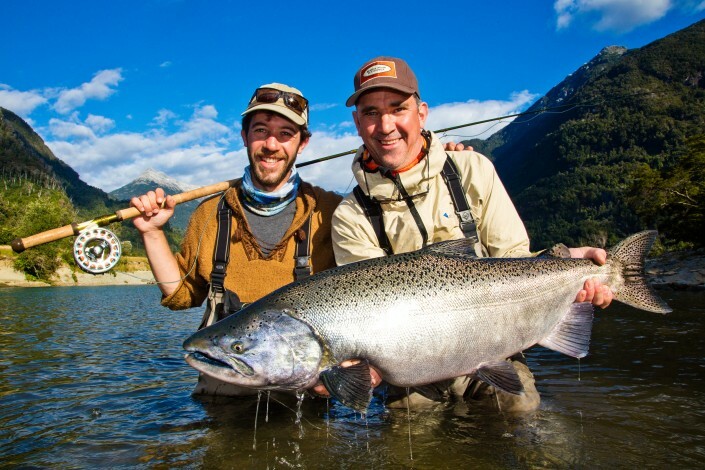 Our exploratory season opened with quite a bang: On the very first morning of the first week’s fishing in early January 2016 steelhead ace and BC guide Derek Barber caught a chrome-bright king salmon of 49 lbs. It’s hard not to be excited after a start like that. Luckily, there was much more to come. During our first season we continued to find new and improved ways to fish for these fresh monster salmon and every week the river would let us in on another one or two of it’s little secrets. We learned how to fish during most situations and take advantage of changes in weather or water level. The river, running through a landscape of granite and sand, is usually very clear throughout the entire season. The only thing than can color up the water is glacial melt off or rain a long way up in the Andes, caused by either warm weather or rain in the mountains. This wasn’t a bad thing but quite the opposite: When the river got a grayish tint the fishing was at it’s best. When we experienced this during our first week it resulted in four anglers hooking eleven kings in a morning’s fishing. Another important lesson was learned during our fourth week: A group of experienced and innovate anglers from the US responded to low and clear water by fishing long leaders and small flies. They had great results with double hook ups and beautiful fresh fish up to 40 lbs landed.